Axe techniques form an important part of a complete bushcraft skill set. I use axes while working in the woods as well as on trips – light use on canoe trips and heavy use on some boreal winter camping trips. 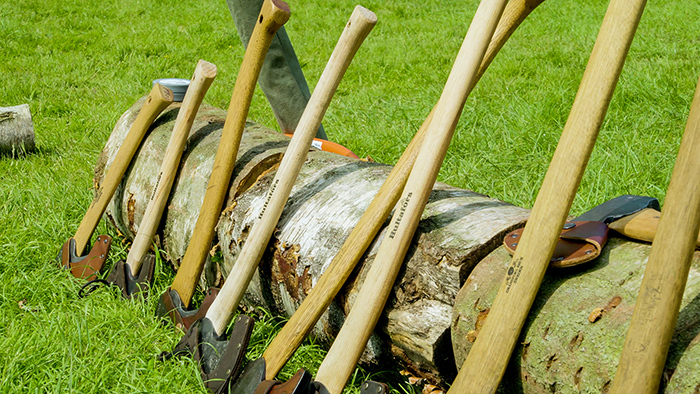 Further, I teach fundamental axe skills to students over the course of a week-long programme that also includes classic campcraft and campfire cookery – a lovely combination of classic woodcraft and camping techniques. At the 2018 Bushcraft Show, like many Bushcraft Shows in previous years, I made a presentation of axes and axe skills. The aim was to introduce axe techniques that suit different sizes and styles of axes, to look at the benefits and limitations of different axes, to share some tips on how to optimise their use as well as underpin everything with solid safety considerations. Weighing up the benefits and limitations of different axes. Image courtesy of Expedition Jack. Given the nature of events such as the Bushcraft Show, the presentation of particular skills or knowledge are inevitably relatively short. I do, however, attempt to keep my axe demos balanced in the ideas they present. Of course there is more to learn than this and learning to do is different to watching someone else and understanding what they are doing but never having done it yourself. This is meant to be a demonstration, not a mini-course. I do hope, however, that someone having watched this demo (or the video below) will be less likely to hurt themselves with an axe when they pick one up for the first time. At the 2018 Bushcraft Show was a young man who was recording video for a piece on his YouTube channel Expedition Jack. We’d done a short interview and he asked if he could film some of my axe demo to add into his Bushcraft Show film. I was fine with this. In the end, he filmed the whole lot and offered to edit it into a standalone video. He’s done a nice job and this is what I am sharing with you below. You can also watch this video on my YouTube channel here. 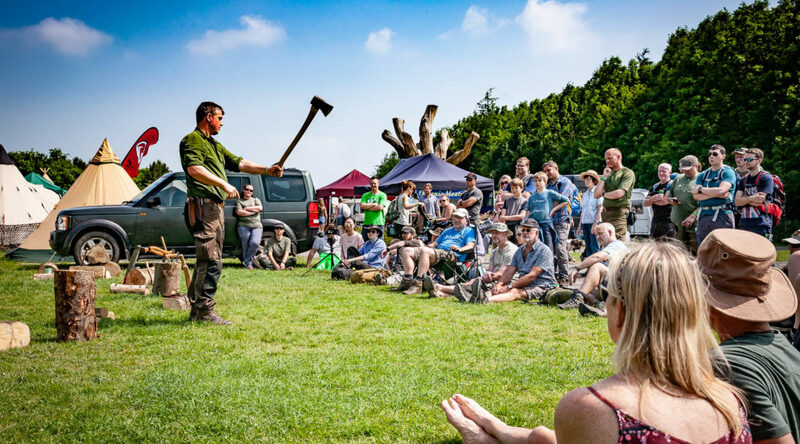 My company Frontier Bushcraft was a main sponsor of the Bushcraft Show again in 2018 and in addition to the above axe demo, I also undertook several tree and plant identification walks as well as a main stage talk. As always with your videoblogs, tutorials or sharing of bushcraft knowledge you get arond the subject in a proffesional, specialist and qualified way. I enjoy your structured approach – also presenting axecraft – i.e. working techniques and positions, tips and tricks. The obvious is not always obvious until seen or told that fx letting gravity do the work, work vertical or horisontical. I’ve done my part of using an axe working in the woods but even though I leant a thing or two as you dig it two spits deep. Your video is much recommendable to whom is into axe techniques. As always, it’s good to hear from you. Thank you for your thoughts and observations on this video and the presentation it contains. I’m glad you appreciate my structured approach as well as the technical content. Another great instructional video. I am quite impressed of your axe skills. I wish my axe skills would be close to yours, but there is quite a bit room for improvement. All that said, I have quite a selection of axes from Gränsfors Bruks and from Wetterlings. A couple of the Wetterlings axes I hand picked in their forge. I can everybody engage to visit the forge. It was a day in my life as an axe lover. The axe is very high on my list of tools and I take care about all of my axes. I only handled a Hultafors axe once so far and I was quite impressed. The Ovako steel and the manufacturing is almost the same for all of those companies, but the axe heads and the handles have differences. I am curious to get your opinion about the Hultafors axes, how do you think are they compared to the Gränsfors Bruks axes? Again, many thanks for sharing this video, I appreciate it! Thank you for your kind comments about my skills. It is down to practise and application in the field. And I love axes too. I did not have the chance to visit Wetterlings but it sounds like a special experience. It is a shame this brand is no longer in production. On the subject of Wetterlings, I was speaking to Julia Kalthoff this last weekend at the Bushcraftfestivalen in Sweden about an exciting new axe project she is working on. There will be a short interview with Julia on a forthcoming Paul Kirtley Podcast (should be episode 32) about this. I’m sure you will find it interesting! https://www.kalthoffaxes.se/ and subsribed to her list. I am curious to get news from Julia’s project. Having said this, Wetterlings’ web side offers again a couple of their old sortiment, but I understood that you can buy these axes only in thier forge at the moment. Having said this, it is indeed a shame that they are not playing in the market as they did in the past anymore. Just a couple of years back they had so exiting new axes like the Bushman axe and the Hudson Bay axe. It must be somehow frustrating for the black smiths to forge Gränsfors Bruks models at the momnet. All that said, my statement does not mean that I don’t like Gränsfors Bruks axes, it is just the opposide. But it is always good to have the choice between the same sized axes with slightly different head weights and handles build with the same great materials and quality. I learned quite a number of new techniques watching the video but I have one complaint that was real bothersome. As a lecturer in my younger days, I understandthe importance that when you talk to an audience you have to try and keep as much eye contact with them as possible. In your video the camera was placed on your side so that the sound of your voice kept going up or down as you were swinging your head left and right. For people having a hearing impairment , like I do, this setup makes it very difficult to follow your speech as half of the time your face is turned away from the camera and therefore it is not possible to do lip reading. Most people with hearing problems do that as you probably know. Tuning up the volume of the computer only increases the background noise and buzz and does not help much. I could not follow a lot of the of your infomation. Placing the camera in the middle of your audience would have solved most of the sound problems. Thanks for your feedback. As you will know from watching all my other material since about 2014, I use a lapel microphone 95% of the time in addition to a high quality on-camera mic. If I am recording my own material, I only ever just use an on-camera mic if I am somewhere quiet and a lav mic will be in the way (e.g. my videos on clothing layers). The video above, however, was not produced by me. As mentioned in the text, it was recorded my a visitor to the show who had a press pass and was filming a video about the show. He was filming my axe demo for some clips for the film but liked it so much, he made me a film of the demo. This is what you can see above. It was not a planned filming. In this sense it is an unofficial film. But I was grateful to Jack for providing it to me and then, by embedding it here, I could share it with more of you. I’m sorry it is difficult to hear – it is difficult for me to hear it in some places too – but the choice was either to release it as it is or not release it at all. I hope this helps explain the situation. Thanks again for your feedback. Well Paul I was surprised! Thinking that at my age and Axe experience, I might find only a 3rd of the content of this presentation new info for me. I found that 90% of it was a new take for me with much safer and effective techniques! Thank you so much for the email notification for this demo. Supper well done! The only improvement I can see was not with the presentation but perhaps in considering using a mic for the video “wireless.” Thanks so much and as Always, Blessings from Oregon, … Mike. Thanks for your feedback on the content. I’m glad there was so much value here for you. As for the sound issues, please see my comments in the video description on how this video came about as well as my comments elsewhere in this thread in response to Pietie. Thanks for your feedback on this video. I’m glad you found it informative, particularly with respect to safety. I liked the chopping down to sticks in the video. Thanks for your feedback. I’m glad you picked up some tips from this. Thanks for posting this recap of key axe tips Paul – a useful reminder from last years’ Woodcrafter course and very timely for me as I’ve just bought a SFA for general use. Will be revisiting my notes on improving the wood finish, and would also welcome that as a future video topic. Cheers.